I never have had a specific math curriculum for my youngest. We have just kind of gone with the flow and taught her counting and number nonchalantly. Well, TouchMath decided to remedy that, and sent me their Pre-K math curriculum (although you can get the curriculum for Pre-K through 2nd grade)! The curriculum I received was something I needed to download onto my computer, which is nice because it gave me that instant gratification of being able to check it out right away! The picture below gives you an idea of some of the worksheet pages that you can print out for your child to use. 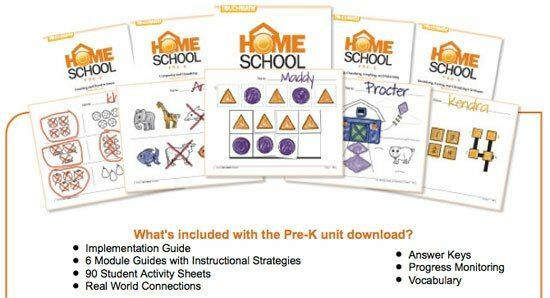 It also gives a list of the things included in the download: Implementation Guide, 6 Module Guides with Instructional Strategies, 90 Student Activity Sheets, Real World Connections, Answer Keys, Progress Monitoring, and Vocabulary. This program is multisensory. It helps your child make the connection between an abstract number written on paper and the same number of objects in front of them. One way it does this is through something they call “TouchPoints”. There are optional manipulatives you can buy to go along with the curriculum. I know the families on The Old Schoolhouse Review Crew that have children with special needs have found the manipulatives to be essential to the curriculum! And, they said it is much more reasonably priced than similar products they have seen. So they are very happy with them. In addition to the curriculum, TouchMath sent me the TouchShapes, 3-D Numerals, and Texture Cards. My daughter has liked using all of them! Here is my oldest daughter working with my youngest daughter on the Texture Cards. She loves it when her big sister helps her with school, so as often as I can, I try to allow that to happen. On the Texture Cards, each Touch Point is numbered. The child is supposed to trace the number and count the Touch Points as they go along. On most of the cards its a very cute way to help them count and remember the value of the written number. I am not a huge fan of the numbers four and seven on the Texture Cards. I’m not sure if you can see on the number four in the picture above, but the order of the Touch Points is a little confusing, I feel. You start top left and go down, counting the first and second bunny touch points and if you continue and go right, like you would if you were writing the number, the next bunny is numbered “4”, then you go up and take the line down and go over 3 and 4 again. I’m not sure of a better way to do it, honestly, but it was confusing for my little one. Same thing with the seven. They have touch points 1-6 on the straight line down, and then on the top line that goes left to right, you will find the number 7 touch point. You don’t write a seven like that, so it seems confusing. Other than that little complaint, we love the program AND the manipulatives. My daughter likes to arrange the 3-D Numerals around and ask us what the number is. For example, she will put down the 5,7, and 3 and ask “What number is this?” and we would say, “573!”. This is obviously way too old for her and it was not a part of the curriculum, but she has a lot of fun with it! The TouchShapes I think would have to be my favorite manipulative to go along with the program. Many of the worksheets have shapes on the page and the child will use the TouchShapes and place them on the shapes on the page. Of course, you don’t have to have the manipulatives to get benefit from this curriculum. It stands well on its own. So, please don’t feel like you can’t use it unless you buy all the extras. The lessons and ideas they present in the curriculum are wonderful and do not require the manipulatives. That being said, if you child is more hands on, then the manipulatives are perfect. One thing I love about the curriculum is that it gives step by step directions on how to use the program. There are some curriculum that when you buy it, you are then left to fend for yourself on how you would like to use it. I guess they think we like the freedom. I like being told exactly what to do and then if I choose to change it, then fine, but I like knowing what the curriculum makers have designed it to do. All in all, I love this program and we will continue to use it. I think my daughter has already learned a lot in the short time we have used it and I can’t wait to see what she has in store to learn with the rest of the curriculum! Did we like it?? YES!! !